The Saivite temple at Sikkal enshrining Navaneetheswarar and Singaravelar is a well visited and ancient temple, revered by the tamil hymns of the tevaram saints and the tiruppugazh hymns of Arunagirinathar. Sikkal is located near Nagappattinam enroute to Tiruvarur. Legend has it that Singaravelar was blessed with the divine spear by his mother Parvati here. The same legend holds at Tirumayilai and Vaideeswaran Koyil, where also, the Subramnayar shrine is of great significance. This temple is rich in history and legend. Sikkal is also closely associated with Ettikkudi and Enkan through the legend of a sculptor who carved the images of Skanda in all three of these shrines. 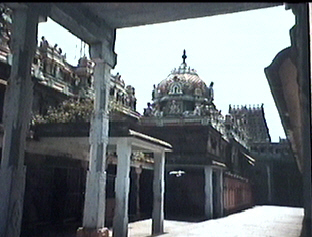 The temple is built on an artificial mound (a maadakkoyil said to have been built by the king Kochenkan Cholan). A pillared hall Kartikaimandapam, with murals on the ceiling depicting instances from Skandapuranam is adjacent to the front entrance. Shiva's shrine faces east, while Singaravelar's and Ambal Velnedunkanni's shrines face south. The jewelry adorning Skanda is of great beauty here. Kartikai asterism each month attracts large crowds here, when the processional image of Singaravelar is placed in the Kartikai Mandapam. Bhramotsavam for Shiva is celebrated in the month of Chittirai, while the Skanda Sashti annual festival is celebrated for 10 days in the month of Aippasi. On the fifth day of the festival, a bejewelled image of Skanda is gifted with a spear, in Velnedunkanni's shrine, and the image of Skanda is said to break out in sweat upon receipt of the spear.